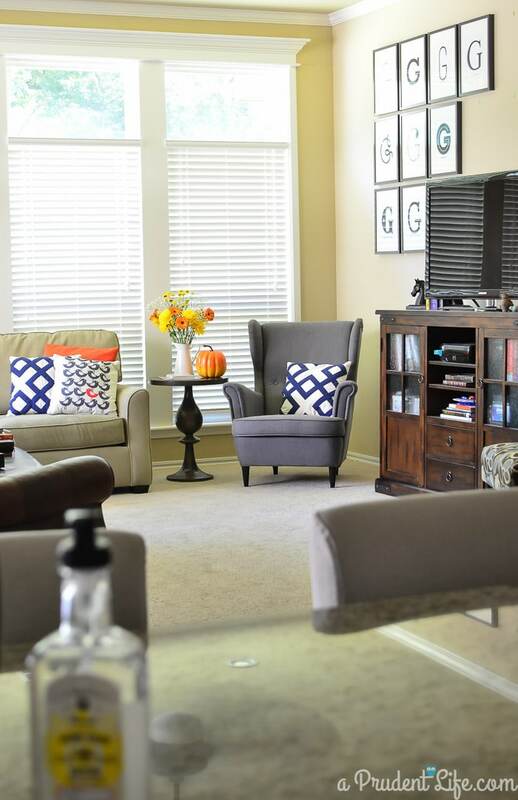 I love looking at blogger’s home tours. Today it’s my turn to contribute to all the fall eye candy going around! We always have a few orange pops of color around, but they multiply like friendly gremlins from September to November. I also throw in pretty much anything metallic that I can come up with to brighten each space. For me, the combination of traditional orange with modern metallic touches is a great balance. But why am I telling you all this when I can just show you the photos??? Let’s start outside! I’m a sucker for friendly scarecrows and yellow mums. We have just enough room on the porch for a small table full of fall color. I wish I could say I made this wreath, but I picked it up on clearance two years ago. 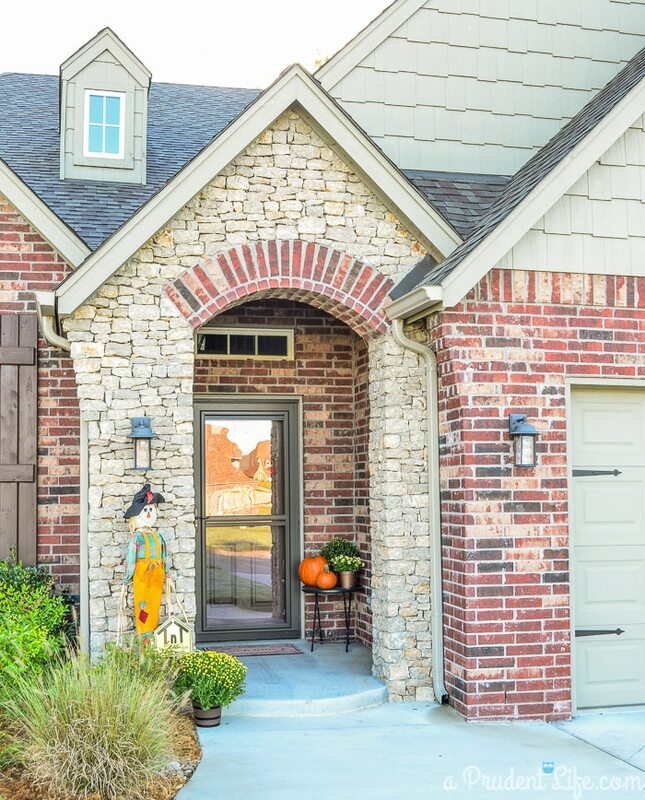 It’s perfect for the brown door and sets the tone for the oranges & metallic color scheme inside. Our office is right off the front door, so I switched out some of the bookcase accessories for more of a subtle fall feel. 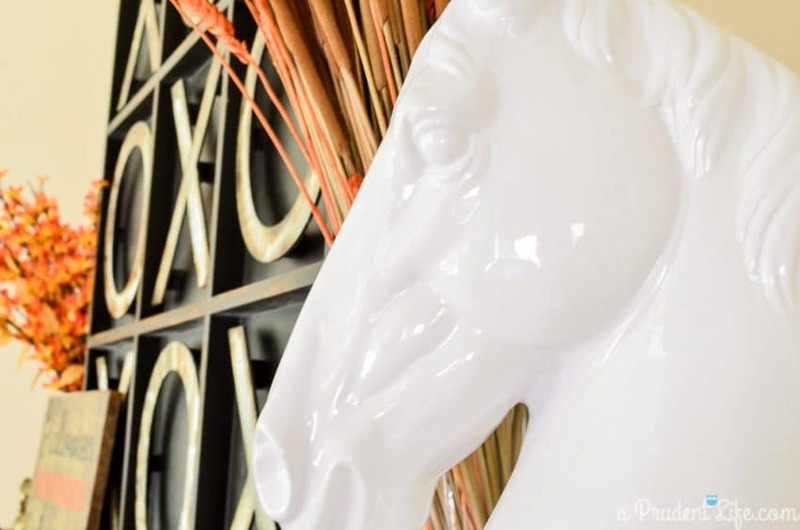 To see the full office reveal from this spring, click the photo! After the office, the next room you come to is the dining room. 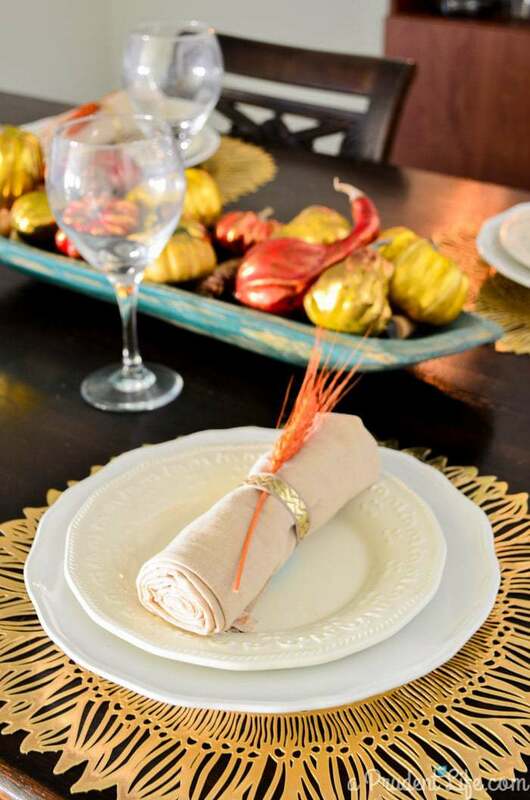 I love the way the place settings came out, but if we really had Thanksgiving at our house we’d be breaking out the fine Chinet. The silver leaf glasses on the sideboard came from my Gram, and the soup tureen came from my husband’s grandparents. I love that we were able to use both of them along side some of our own favorites. 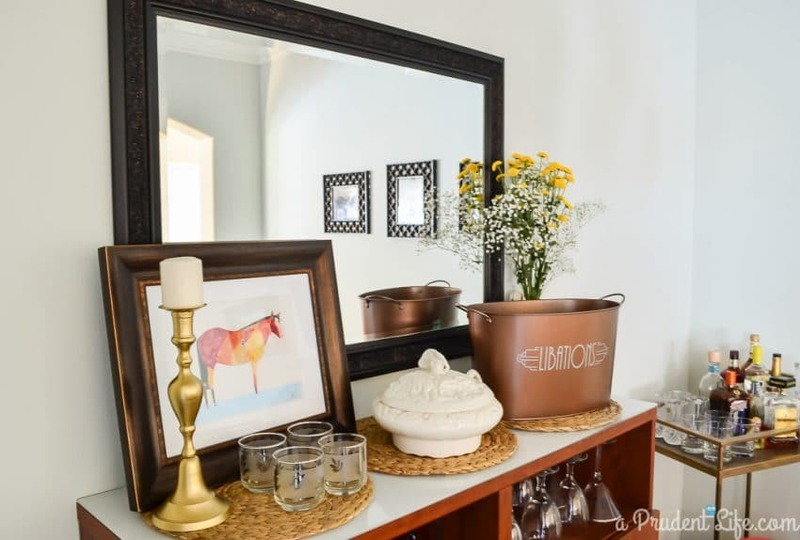 I made the libations drink bucket earlier this year and we bought the horse print at an art festival. It’s a rare day either of us find art that we love, and even more rare that we love the same thing. When we found this artist, we knew we had to buy something! 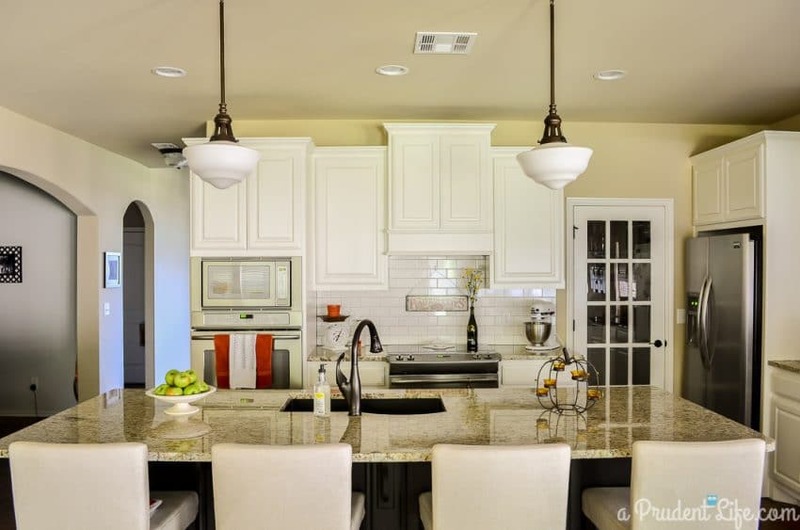 Our kitchen is right across from the dining room. A few pops of orange make it feel warmer for fall. 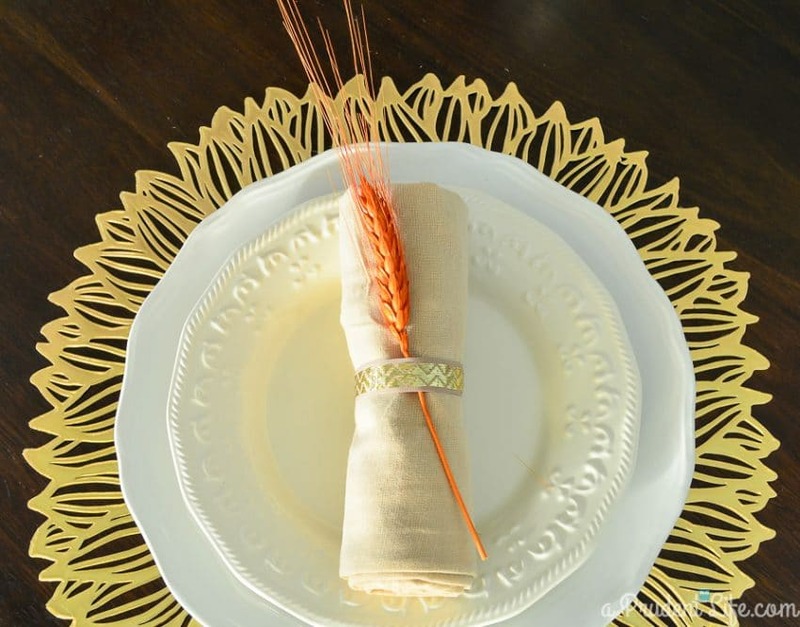 My Anthro Inspired Fringed Feather Towel is perfect for the season! To see the rest of the kitchen, you can check out the kitchen tour here. 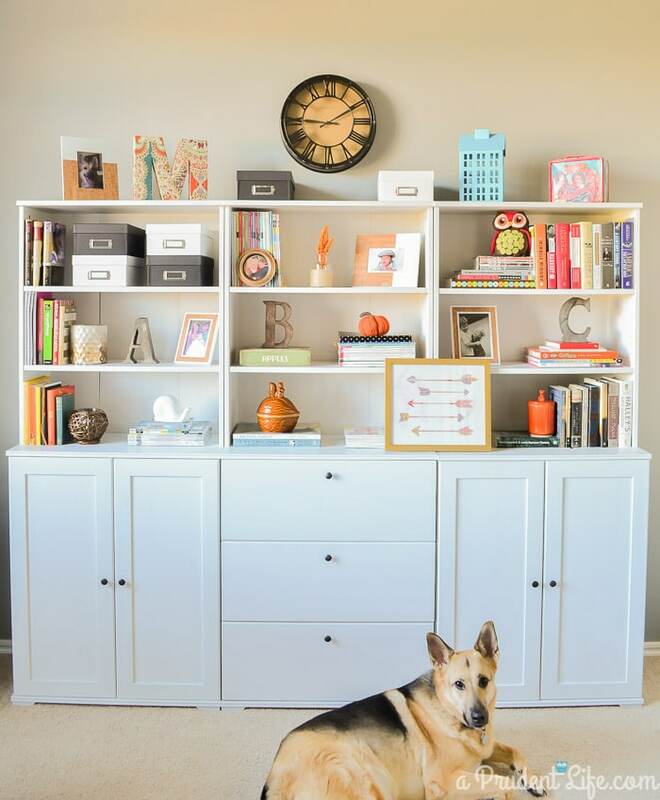 We have an IKEA Hemnes shoe cabinet in the kitchen that makes a great faux mantel for seasonal decor. It was the perfect place for my Leaf Monogram Wreath. 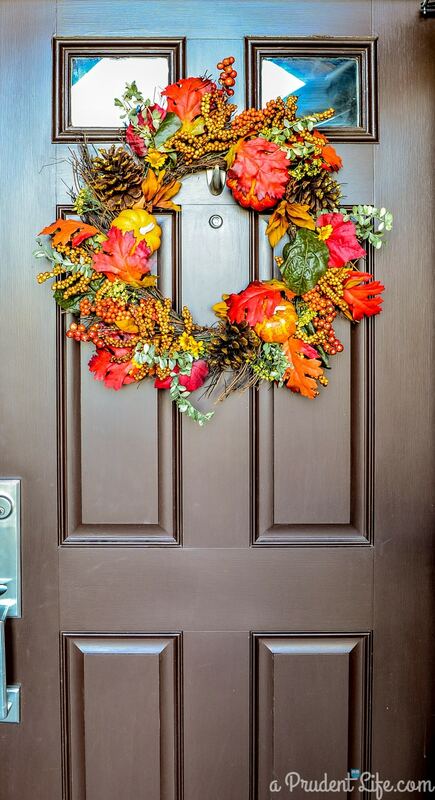 If you need a quick project for a pop of fall in your home, this one only takes 15 minutes! 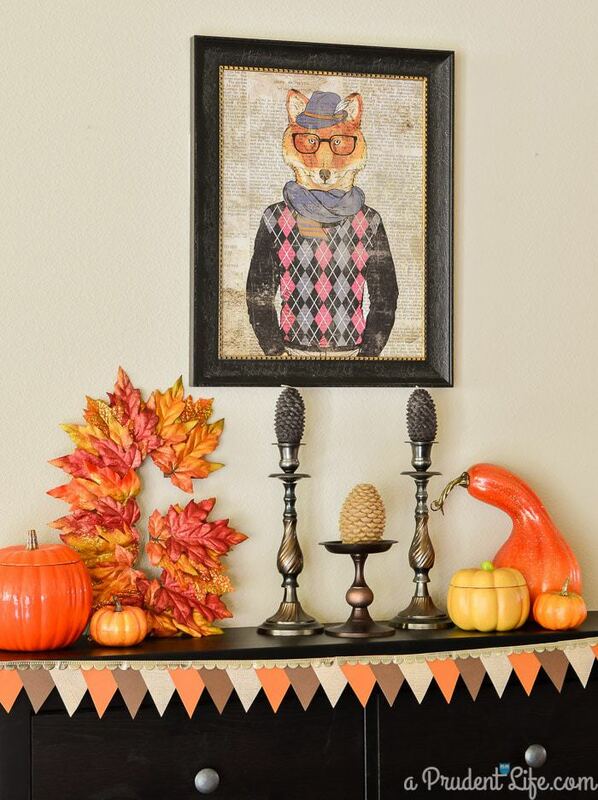 The adorable hipster fox is from Hobby Lobby. Looking out from the kitchen, you can see the family room. This has nothing to do with fall, but we are in the middle of making a GIANT typography gallery wall! In my mind, I was going to use ten frames. Four on each side of the TV & two above the TV. Well, it turns out what I REALLY wanted was 32 frames that reached wall to wall and almost to the ceiling. It’s going to be AMAZING, especially after going on three years with a big blank wall. We’re trying to figure out when we can make a trip down to IKEA for the rest of the frames. Even though it’s not done, I’m completely in love with it! 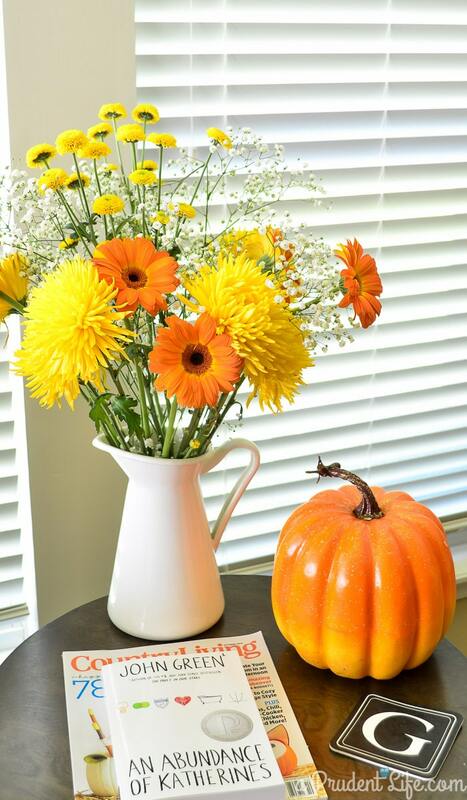 Fresh flowers are perfect for every season! 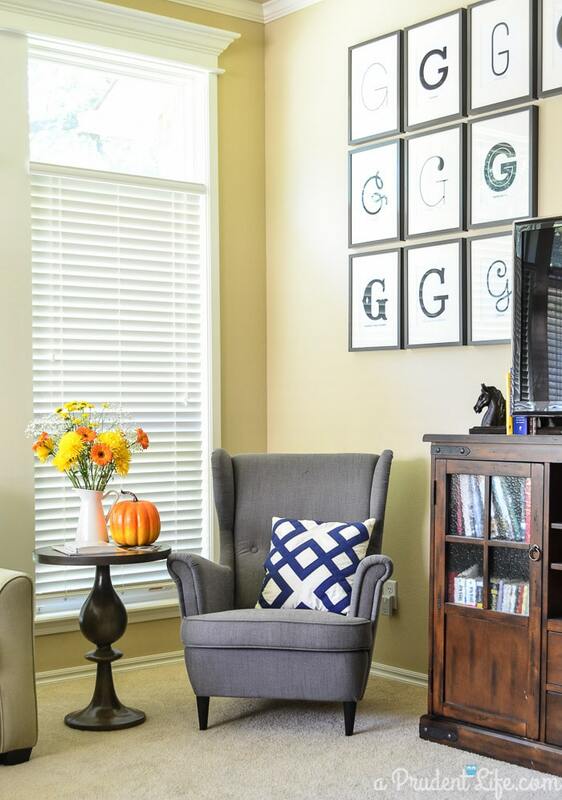 Magazines are a great way to bring in a little seasonal color as well. 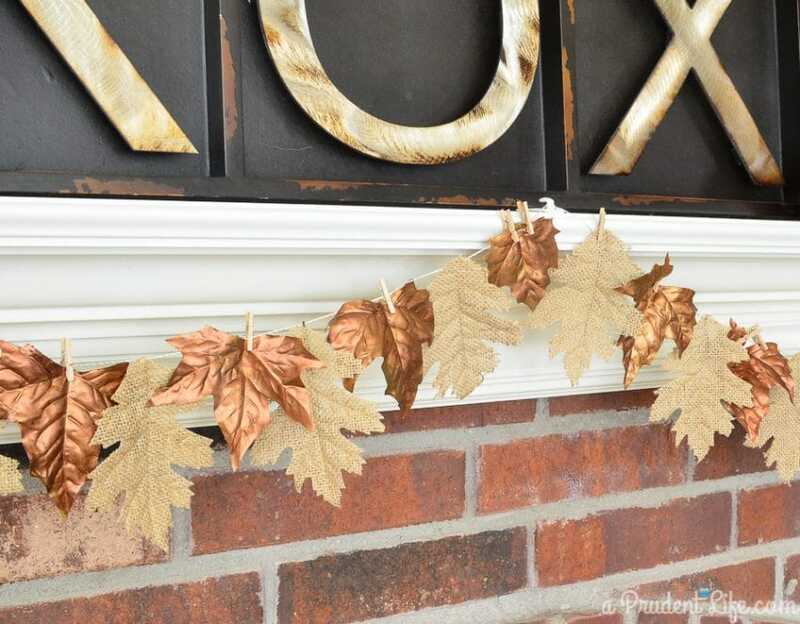 I shared a tutorial for this burlap and bronze garland over at OneKriegerChick. 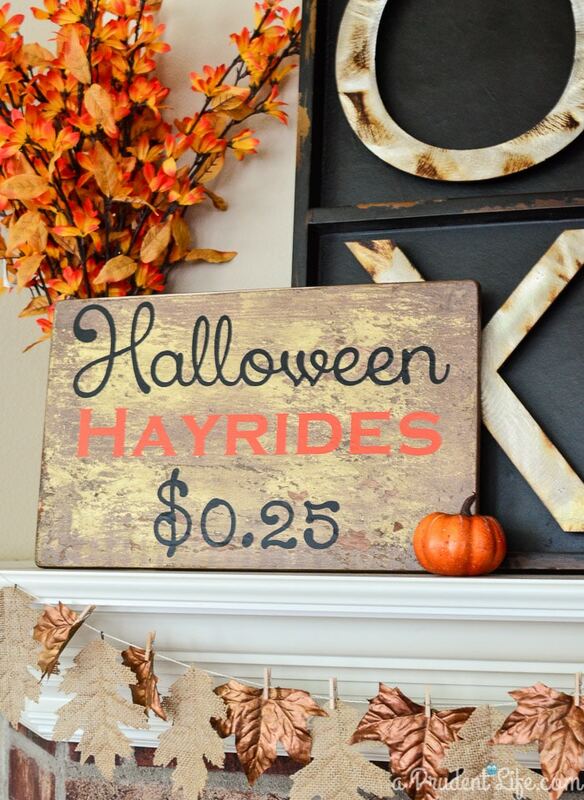 Another new item this year was my Halloween Hayride sign! That’s all the fall we’ve got going on this year – at least so far! If you liked my tour, I’d love you to sign up for my email list here before moving on to the next house. Thanks for stopping by! Gorgeous!! 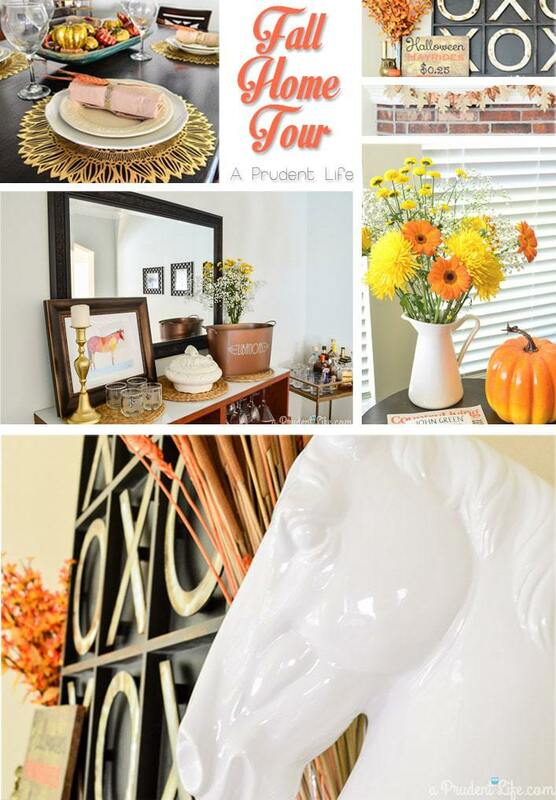 I love your home tour…fabulous fall vignettes and fun hits of colour. Beautiful! Is that fox picture a recent HL find? I have a thing for foxes. I think I need him in my life! They still had him about two weeks ago when I was there! 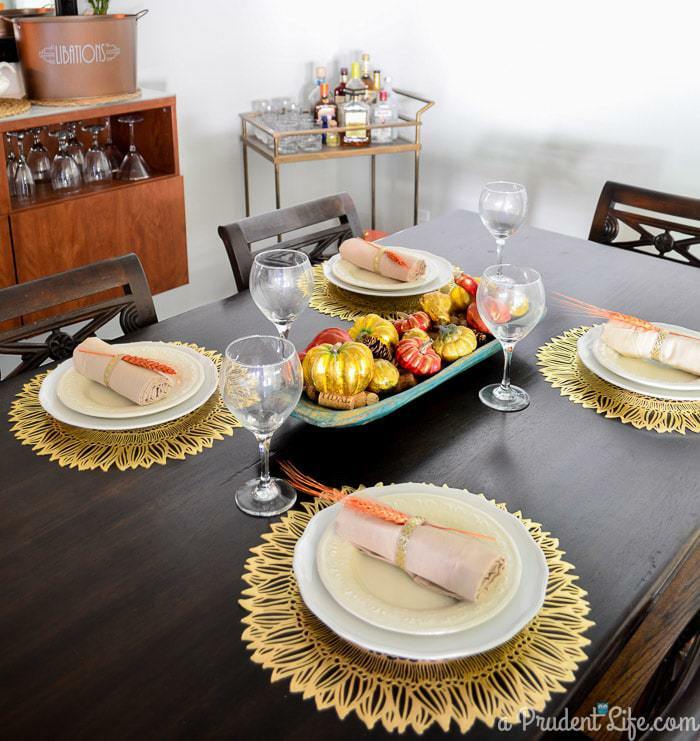 Those chargers/placemats are FANTASTIC. Do you know where they came from? Thank you! I found them at a store called Old Time Pottery. They were only $1.49!!! Thanks so much for visiting! Yes, the bookshelves are IKEA BORGSJO. We love them! Thanks Melissa, I just checked IKEA for the item but they are not a solid white color. They look white-washed. Yours maybe an older version because they look solid white? Here is a link to IKEA you can see what I mean. If you zoom in the finish looks different from yours. They do have gray woodgrain in them in real life, it just doesn’t come through in the photos. We were worried about it when we ordered them because we hadn’t seen the finish is real life, but it’s not bad at all. We may eventually have to paint them because we want to add trim between the upper parts so it looks more like one big unit. If we did that, we’d have to paint everyrhing to match. So for now, we’re just enjoying them as is! I love your house! Excited to have stumbled upon your blog. We’re a “G” family too, so I love seeing your G’s all over! Thank you Kristen!! The tic tac toe came from Kirklands, but it’s been a couple years so I’m not sure if they still make them.